DIMENSIONS: (19W x 20L x 17H) This unit is a complete WOW FACTOR! 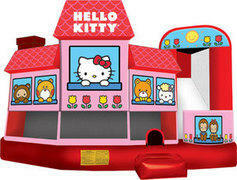 If you are looking for the ultimate Hello Kitty Bounce House for your childs birthday party or event, look no further! This is it! Plus there's more! This inflatable is loaded with 5 interactives all under one roof. Inside this Huge 5-in-1 combo you will find a large jumping area, a fun slide, obstacles, stair climb and a basketball hoop. Also, the theme is authentic, with it's licensing labeled directly on it, the art work is done officially by SANRIO. NO KNOCK-OFF VELCRO PICTURE STICK-ON's HERE! THIS IS THE REAL DEAL HELLO KITTY! ANY OTHER ARE INFRINGEMENTS! GET THE REAL STUFF HERE!